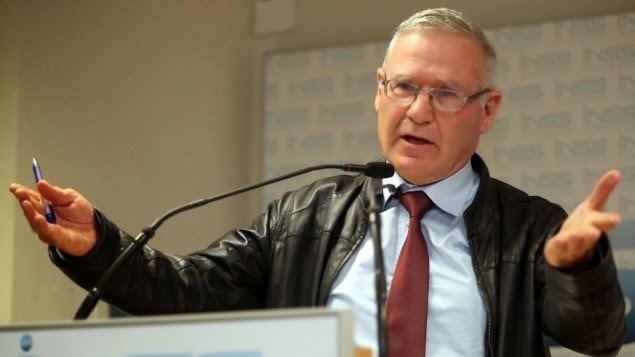 "In a probing interview with New Republic published on Wednesday, former IDF intelligence chief Amos Yadlin made his assessment clear: the coming year would be the year of decision for Israel," reports the Times of Israel . "The next several months, he said, would provide the last opportunity for Israel to confidently and effectively strike Iran’s nuclear program, if that's what it chooses to do." "Yadlin, now the director of the Tel Aviv-based Institute of National Security Studies, was careful not to advocate for an attack in the interview, and he made clear that Israel also has the option in the coming months to decide to leave the Iranian issue to the Obama administration, or Jerusalem could decide to live with a nuclear-capable Iran," notes the Times . "According to Yadlin, the timetable for an American decision is different, as US capabilities leave the option of a military strike available for longer. 'For the US, because of their capabilities, it is at least a year post-Israel and will depend on many operational parameters that should not be public knowledge,' he told the magazine's Ben Birnbaum. He assessed, however, that US opposition to an Israeli strike on Iran may lessen depending on the success of ongoing negotiations between the West and the Iranian regime." "I think in late 2013 or early 2014, especially if America sees that Iran is not serious about reaching an acceptable agreement and only continues to buy time, the US will accept an Israeli attack because a nuclear Iran is absolutely against American vital national security interests," Yadlin said. "The negotiations over the Islamic Republic's nuclear program, which resumed last week in Geneva and left P5+1 representatives upbeat about conditions for a possible deal, are a win-win for Israel, the former military intelligence chief reasoned," reports the Times . "If a deal is reached 'which is reliable and contains intrusive inspections and turns the nuclear clock backwards, it's better than the dangerous options of the 'bomb or the bombing.' And if negotiations fail, then there will be legitimacy to take preventive action to stop Iran,' he said. Yadlin, who helped persuade then-defense minister Ehud Barak and Netanyahu back in 2010 not to strike Iran, said that the probability for a successful Israeli attack against Tehran's nuclear program would soon diminish. 'It can be the last quarter of 2013 or the first, second or even third quarter of 2014. There is not a certain deadline, but the probability of success will eventually decrease to a level that may change the decision to launch the attack.'"